Silvex is the number one choice for silver electroplating of stainless steel flatware in America. In fact, our quality bright silver electroplate has been enhancing the luxury of 18/0, 18/8 and 18/10 stainless steel flatware for many of the world’s leading hotel and restaurant supply companies for 30 years. 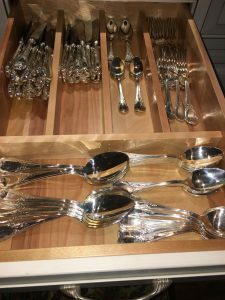 This work is all performed in our ISO9001:2015 and AS9100D certified facility that was built and designed specifically for plating flatware. Our hoist operated plating line utilizes specifically designed rack fixtures that ensure silver thickness consistency throughout the order and allows flexibility in the operation to vary the process for specific customer requirements. The proprietary three-stage cleaning process that includes the use of ultrasonics ensures that all grease, oils, and buffing compounds are completely and thoroughly removed prior to the silver plate. Silvex also applies a 3-micron layer of nickel plate under the silver to enhance corrosion resistance, increase the hardness, and brighten the plating finish. The 99.9% pure silver electroplate can be done in 6, 7, 10, 20, and 33 microns thickness. All orders are tested for thickness compliance via the use of an x-ray fluorescent machine. Adhesion is then verified by a prolonged burnish in a very aggressive media in our burnishing machine. If there is any visible evidence of poor adhesion, the lot is rejected and re-processed. That attention to detail is why we can offer our customers a lifetime warranty for adhesion. Our craftsmen visually inspect all parts before they are individually bagged in poly pro bags, packed in inner boxes, and then master cartons. We also offer our customers bar coding and re-labeling services. Contact Silvex today for silverware plating projects of large and small scale. We have the capability to move over 20,000 pieces through our plating process per day, so we pride ourselves on delivering the finished product on time. Call us at 207-761-0392 or Contact Us.